Wraps, summer sausage (or pepperoni) and cheese. To prepare: Pull a burrito wrap out of the package, slice summer sausage and cheese. Wrap it up and eat. To pack: To preserve the wraps in your food bag, wrap them around the outside of bag so that the wraps follow the contours. Options: On a cold, wind day consider cooking the wrap in the fire. Wasa crackers, cheese, sausage and horseradish mustard. To prepare: Take a Wasa cracker, slice sausage and cheese onto the cracker and cover with a big helping of mustard. To pack: Wasa crackers are hardy, but take care when packing them. Keep them in that paper package they come in and pack at the top of your food bag. Many grocery stores carry horseradish mustard in plastic squeeze bottles. Peanut butter, summer sausage and some maple syrup…all wrapped up in a tortilla. This idea comes from Sven Hoaglund. I’m not so sure about the peanut butter, but maple syrup on sausage tastes great. If Andrew Zimmern can eat bizarre foods, so can paddlers. It’s probably tasty. Hot soup. To prepare: Kurt Penner suggests heating up soup at breakfast, storing it in a lightweight thermos and eating it a lunch. This is especially good on cold, rainy days. I like carrying along instant soup mixes, which makes the process as easy as heating water and opening a package of soup. Fruit, pepperjack cheese and a walnut, dried cranberries and sunflower seed mix. Combined with a lovely crusty loaf of Italian or other good bread covered with olive oil that had herbs and pepper and garlic steeping all day. This suggestion from Tracy Prior Seffers would work best on shorter trips where you can protect the bread or on trips that you’re motivated to make bread the night before. Four-oz bag of chicken salad with multigrain sandwich thins, a couple sticks of Polly-O cheese, some Spanish olives. 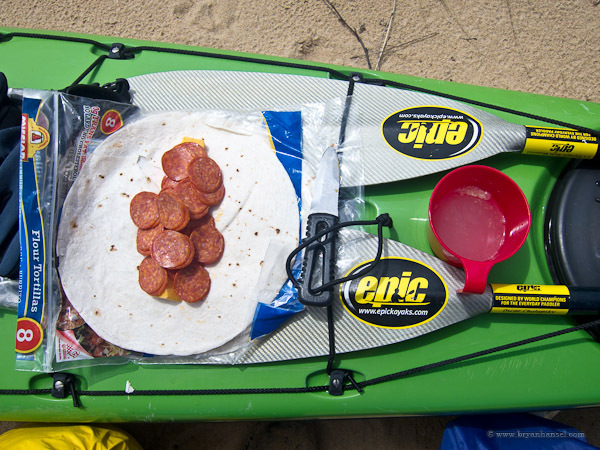 To pack: Kayak Gus tells us that this combo fits inside a ziplock bag with a single-serve Gatorade drink mix and a Clif Bar. Hummus with mini pitas. This idea comes from Agnes Jung. To prepare: Mix powdered hummus with water until the hummus forms a paste-like consistency. I find that mixing the hummus at breakfast and storing it in a plastic bag makes lunch prep faster. Pitas! You can put lots of stuff in them such as PB&J, Honey, sausage slices, smoked salmon or tuna from a pouch, cheese, dried beef, etc. To pack: Pitas are fragile so store them on the top of the food bag. You could substitute burrito wraps for pitas and use all the same ideas.